At Craft Corp, we want our customers to be knowledgeable not only about the type of roof that’s right their home, but be able to ask questions along the way. Knowing the key elements of a roof can help you speak with your contractor. 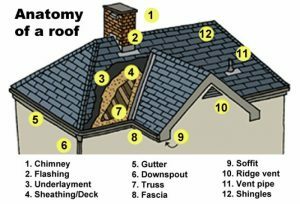 We’ve highlighted 12 of the most common roofing elements. CHIMNEY: A vertical channel or pipe that conducts smoke and combustion gases up from a fire or furnace and typically through the roof of a building. FLASHING: Pieces of metal used to prevent water seepage into a building around the roof such as vent pipes, skylights, chimneys, adjoining walls, etc. UNDERLAYMENT: An extra layer of protection on top of the sheathing. SHEATHING/DECK: Any sheet or board material connected to the roof rafters to add strength to the structure and serve as a base for shingles, metal roofing or other roof coverings. GUTTER: Channels attached to the fascia to carry away rain. DOWNSPOUT: A pipe for carrying rain water from the gutter. TRUSS: A rigid framework made of wooden beams or metal bars designed to support a structure. FASCIA: A horizontal board fastened to the lower ends of roof rafters. Rain gutters are usually attached to them. SOFFIT: The material forming a ceiling from the top of an exterior house wall to the outer edge of the roof. It’s often vented to provide regular air circulation into the attic. RIDGE VENT: A type of vent installed at the highest point of a sloped roof, which allows warm, humid air to escape out of the attic. VENT PIPE: A plastic or cast-iron pipe that’s connected to the home’s plumbing system. It pokes through the roof and admits fresh air into the plumbing system, which helps sinks, tubs and toilets to drain quickly and efficiently. SHINGLES: The top coat of a roof. Asphalt shingles are the most common roof shingles installed today, but wood shingles and shakes, metal and tile are also popular.